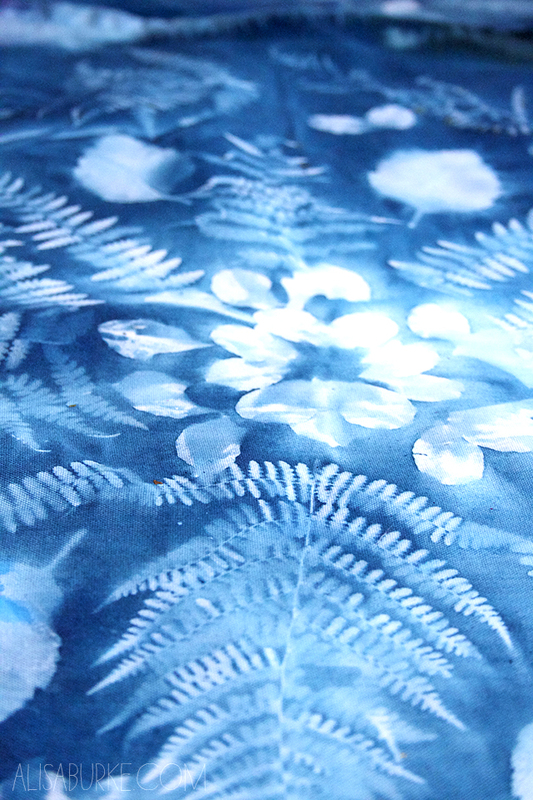 Sun prints are typically created with special paper or fabric treated with cyanotype (a solution of potassium ferricyanide and ferric ammonium citrate that can be exposed to a UV light source to create a print). Kinda sounds complicated right? 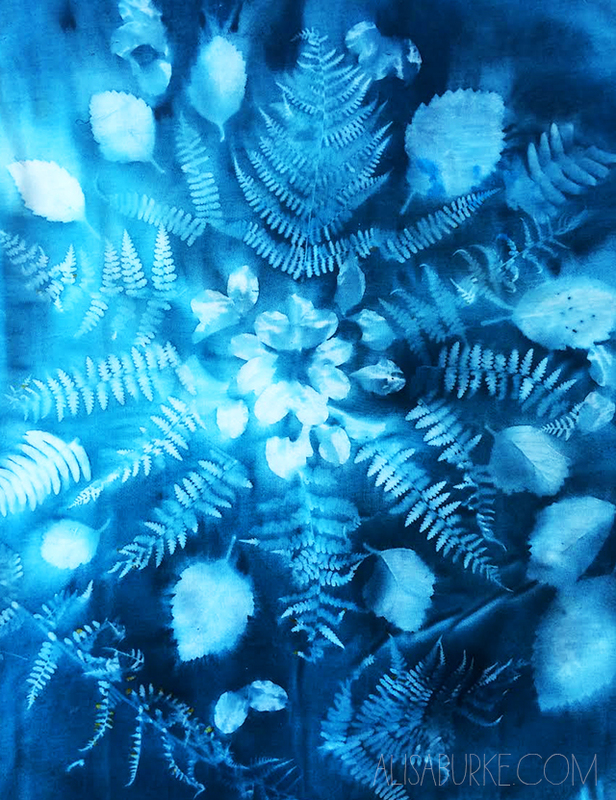 While you can buy paper or fabric treated with cyanotype, or even light sensitive paints and dyes, there is a much easier and cheaper way to create the same effect on fabric. If you have spent time playing around with surface design techniques, resists or using leaves on fabric, it is likely that you may have discovered that you can place objects onto a wet painted surface. Once they dry they will leave an imprint of the object. I discovered this years ago when I was painting outside on a sunny day and leaves and grass got stuck to my wet canvas. Recently (when we had a heat spell) I thought it would be a fun technique to share with Lucy. 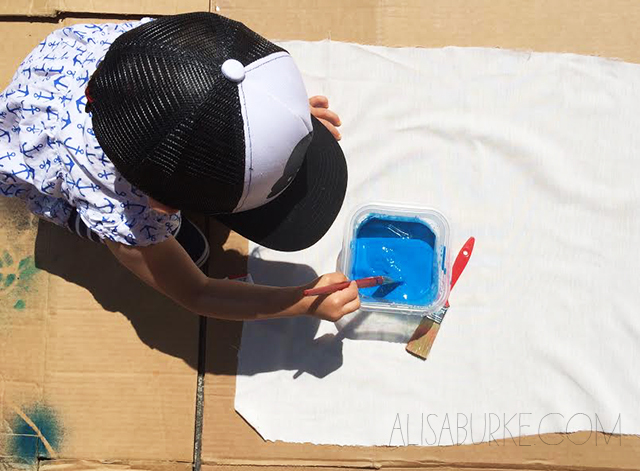 It is a really easy way to create a simple sun print and a perfect project for warm sunny day! 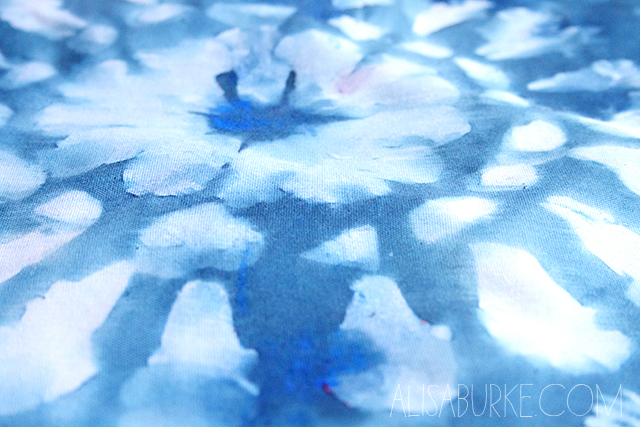 Using acrylic paint, cover the surface of your fabric. I prefer to use watered down paint (or even dye). Thick layers of paint will not work for this technique. 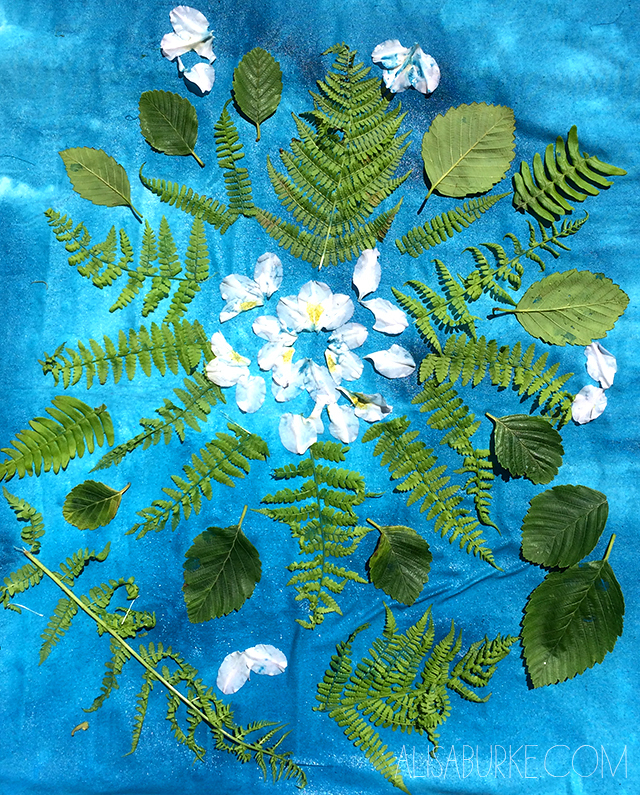 Next, press flowers, leaves or just about anything onto the surface of the wet fabric. Let everything sit in the sun for 1-2 hours or until dry. While it is drying the leaves will be absorbing the wet pigment. 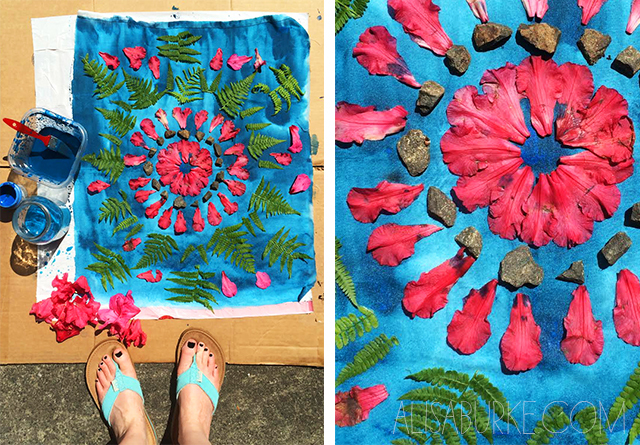 Pull leaves from the fabric and you are left with a beautiful print. 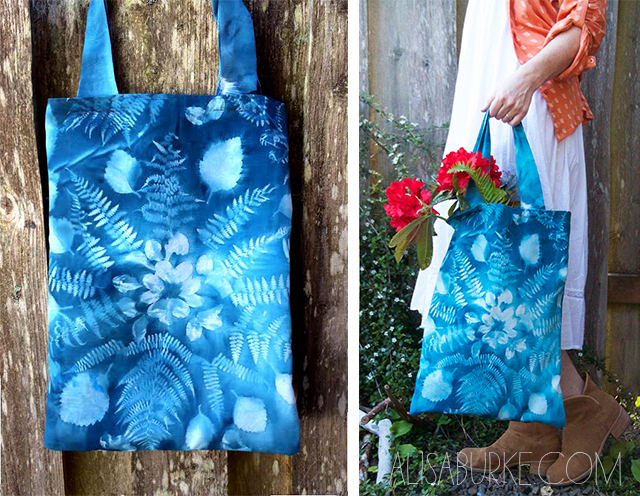 And of course I couldn't resist using my fabric to create a simple tote! This is so stunning! I have to try it this summer. Thanks for sharing all your creative ideas, Alisa! Un sac splendide !... je l'aime énormément. Il est si précieux. Excellent results!!! I love to sun print. I recently purchased some solar dyes and can't wait to try them out. I have found if the leaves are a little wilty, you get the best results and the more humid the day, the more fine details like veins show up. Clumps of grapes, or clumps of berries from nature are fun to print, too. You get an interesting perspective print due to the roundness. Have fun! Really cool (and easy!) technique! It looks a little bit like an x-r. Very clever, got to try this out.Thanks for sharing. Fantastic !! 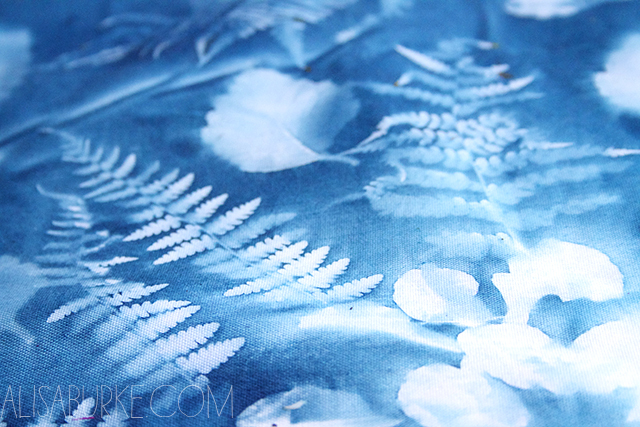 A cyanotype on fabric, without nasty chemicals !! Such a cool idea! Thanks for the tip! The result is awesome! nice effect! I especially like the ferny ! Are you kidding??? sunprints without special paint or chemical? Only acrylic paint??? You are my hero and a creative genius! I need to do this! Thank you!!! OMG, that's gorgeous! 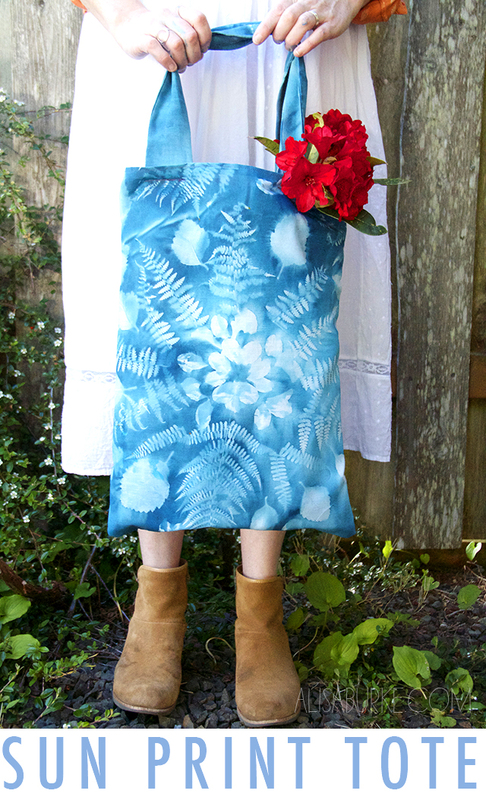 I love botanical prints! This is wonderful and beautiful! Thank you so much for the easy tip!!!! Can't wait to give it a try!!!! I can't wait to try this! I wonder if you could achieve the same effect on a canvas. Thanks so much for sharing all of your creative ideas! genius ! I didnt't know you could do this without special paint, I will try for sure. Thanks ! I'm always amazed with what you come up with, thanks for sharing your great ideas. So, sooooo cool! I'm in an on-line quilt challenge group and this would be so fun to try for some background fabric! Thank you!!! Thanks Alison! This is one of those old school techniques one forgets totally until they are brought to mind..and so pretty! A great project with a child, too! It's beautiful. Great idea, I can't wait to try it. This is so so so so neat Alisa!!! I love it! I've always admired sun prints...so this is awesome to me. Clever you. Beautiful!!! Definitely gonna try it. Thx! AWESOME! this is on the list of things to try! I have used Setacolor Sunpaint for this technique - there is also a product called Inkodye that allows sun printed photos that were printed on printer paper to be imprinted on fabric in the sun. I am anxious to try the Inkodye - (sold on Dharma Trading) when I receive it. Awesome idea! I did not know you could do this with paint. Now if it will stop raining in Ohio, I'll be set. Stunning and awesome technique !! thx Alisa !! Great idea, I have to try to do a similar bag. Thank you so much for sharing your experiments! I did it todsy it is wonderful amazing tecnique. Thanks a million. You are one clever little cookie! I would never have thought of thought even though i see the affects the gum leaves make on the ground on footpaths around these parts. I've just come across from your latest blog – sun print gift boxes. Another project I'll be trying out. Thank you!